Do you have a lot of digital photos? Do you want to turn them into a professional movie with a lot of effects and background music? It is really easy to do it with this program! You friends will highly evaluate the created movies because your photos come to life in them! 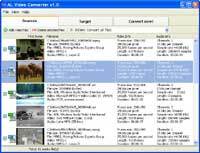 Slideshow Movie Producer allows you to create movies and even full-length films in the MPEG1, MPEG2, DivX, xVid formats out of your digital photos. This program enables you to quickly create slideshows incorporating both picture and audio files. The slideshow can be created as an executable (.EXE) file, or as a screensaver (.SCR) file. The program includes 182 transitional effects. No other programs are required to view your personally created slideshow. You can send slideshows to friends, family or other interested parties via e-mail, websites, CD, DVD etc. With this program you can create a professional slide show within minutes. Besides creating exceptional photo albums, this program can also be used to make business presentations, educational tutorials, product or service endorsements, anything you can imagine. If you have a digital camera, astonish your friends by making a slideshow within in minutes of taking the pictures, sending it to them and then exporting the individual photos they like the most as a JPEG or BMP file. This program can make your fondest dreams come true within your lifetime. Now you can create a screensaver in minutes! ALSoft Video Converter lets you easily to convert video files between different formats AVI, MPEG-1, MPEG-2, VCD, SVCD and DVD. You can convert AVI to MPEG-1(2) or MPEG-1(2) to AVI. Batch conversion feature save your time when converting a large quantity of video files. A various of video and audio parameters including Frame Rate, Resolution, NTSC/PAL, Sample Rate and Bit Rate are supported. Duplicate File Detector is a powerful tool to search for file duplicates on your computer. It can find duplicates of any files: text, binary, music or image. Algorithms used in the program allow for quickly analyzing of content of small and large files. The following criteria can be used search for duplicates: filename, file size, or file content. For multimedia files (MP3, OGG/Vorbis, WMA), the content of the following tags can be also analyzed: "Artist", "Album", "Title" and "Comment". Let Duplicate File Detector analyze the contents of your hard drive and you will be impressed seeing how many identical files you have! You can free disk space by deleting duplicates, but be careful: do not delete files if you are not sure about them! The "Fast Printer Chooser" program can be used to quickly and conveniently switch the active printer using a tray popup menu. The program can work with all printers installed in the system including local and network printers. You can not only change the active printer in a single mouse click, but also quickly cancel printing tasks for any printer. 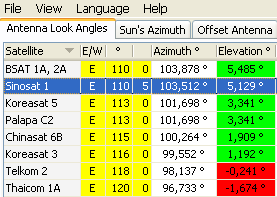 This program is used to calculate the angles necessary for installing satellite antennas. The main difference from similar software is the possibility to calculate the position for all satellites at once. Additionally, the program has a mechanism for calculating the azimuth of the sun. This program works as a notebook with hierarchical tree-like structure of organization. Now all your notes will be under your fingertips! Neat Notes 2005 can store information containing URL, text, tables, or graphs. The tree-like structure helps to quickly locate the information you need. Built-in notes editor will help you format your text in the editor style of MS Word with full support of tables, paragraphs, lists, fonts, fills, and alignment. All information is encrypted and can be secured with a password and protected from accidental deleting. This will allow you to save private information like passwords, credit card numbers, addresses, and telephone numbers. This program is addition to the control panel Windows Fonts. It allows more convenient to establish new fonts on the computer. With the help of this program you can look through any fonts, how they will be installed on your computer. The fonts can be on CD-R, CD-RW, hard drive or on any other carrier supported your computer. You can look through fonts before as they will be installed. At viewing it is possible to change color of a background, color of symbols, size of the chosen font. Still it is possible to set a string or character set for viewing. You can install a font by one pressing of the button. AL Folder Browser is the program intended for more convenient looking through your folders and files. The program put itself to Autostart folder and once started situates into system tray. You are able to get a fast access to your folders and files at any time. Floppy disks, hard disks, CD drives and networks drives are supported. You get an ability to define Global Hot keys for the actions shown above as well as use the popup menu called from system tray icon. The are features which let you schedule the processes of restarting and shutdown your computer. You can determine the time when your computer should be turned off or restarted. Also you can get some information about your hard drives (free space, label, FAT/FAT32/NTFS). This program helps to receive a lot of information on yours the processor. The following information is accessible: name of CPU (Pentium I-IV, Pentium Pro, Celeron, Athlon, Duron, i486....), vendor, CPU frequency, serial number, FDiv bug (for pentium), CPU type (OEM, overdrive...), extensions CPU, cache information and feature set. CPU of manufacture Intel, AMD, Cyrix are supported. software for proximity advertising via Bluetooth connectivity. "Bluetooth Promoter 24x7" provides free transmission of any files (TXT, MP3, JPG, 3GP, MP4, vCal, vCard) to any Bluetooth devices (mobile phones, smartphones, hand-held devices, communicators, laptops, mini-laptop computers) within coverage over Bluetooth. You can use "Bluetooth Promoter 24x7" for distributing your promo materials with no time constraints, i.e. 24 hours a day, 7 days a week, year around, without any additional expenses whatsoever. Does not require any special hardware - only a computer (PC, laptop) and a Bluetooth dongle. Absolutely any files can be distributed; however, keep in mind that the files must be viewable on your customers' Bluetooth devices. Both content transmitted and transmission via Bluetooth are totally free for both consumer and advertiser. Slideshow Movie Producer - FAQ - Download now! - Buy now! ALSoft Video Converter - Download Now! - Buy now! Duplicate File Detector - Download Now! - Buy Now! Satellite Antenna Alignment - Download Now! - Buy Now! Fast Printer Chooser - Download Now! - Buy Now! AL Pictures Slideshow Studio - Download Now! - Buy Now! Neat Notes 2005 - FAQ - Download Now! - Buy Now! AL Font Installer - Download Now! - Buy Now! Copyright © 2001-2018 AL-Software team. All rights reserved.